T-Shirt Quilt Style - Order or Chaos? There are two major styles of T-Shirt quilts. What I refer to as 'Order' and 'Chaos'. OK, that seems like an extreme comparison, but let's look at the difference between order and chaos as pertains to t-shirt quilts. First of all, I grew up looking at quilts that two of my great-grandmothers and my grandmother made or were working on. In high school, my favorite classes were geometry, accounting, physics and silver-smithing (I went to a great high-school - we also had archery and canoeing as phys-ed options). I was a computer programmer in the corporate world. I like lists. I like to read Science Fiction. OK, yeah, I am a geek. But, all of these studies involve science and ORDER. So, how does that pertain to quilts you ask?? T-Shirt quilts fall into these same categories. A traditional quilt is generally created using uniform sized blocks that are laid out in columns and rows. Traditional t-shirt quilts will appeal to most people because their sub-conscious wants this order and the 'eye' wants to see things in an ordered way. A random quilt can be done in many ways. If you have ever looked at the random styled t-shirt quilts, you will either love 'em or hate 'em. Couple of reasons for this. It takes a lot of skill and creativity to lay out a random style t-shirt quilt in a pleasing manner. Most people don't have that skill. 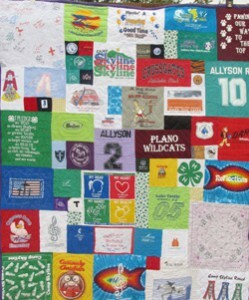 There are a few t-shirt quilt providers out there that have formulas for creating these quilts, but, the problem is that the color and value of the t-shirts are usually not taken into account. Sometimes, the formula works, but more often than not, the resulting quilt just looks like chaos. Note: After writing this blog entry, another company who specializes in Puzzle/Chaos/Random quilts took great offense at my post. If you note, I NEVER mentioned their company by name or to the 'puzzle' method as they call their process. My entire post is explaining WHY WE make the quilts we make. They spent a great deal of time trying to justify why they do their method. That is great! They have 'their' process, and we have ours. If you would like to read their response, click HERE. At T-Shirt Quilts of Texas we are known for our high quality 'TRADITIONAL" quilts and proud of it! We have years and years of experience looking at the shirts that you provide, and coming up with a pleasing and satisfying layout of the shirts.